The smooth operation and reliability of Toyota forklifts has been instrumental in the decision by an Orange, NSW, fruit grower to stick with the brand for the past 14 years, its managing director says. Two of Bonny Glen’s Toyota battery-electric forklifts. 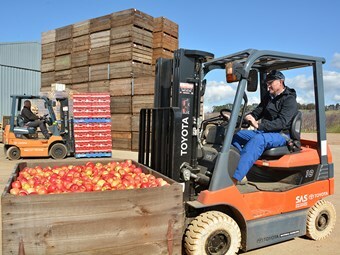 Family-based Bonny Glen Fruits now runs six of Toyota Material Handling’s 1.8-tonne-payload, battery-electric forklifts, including three at its packing plant on Canobolas Road, near Mount Canobolas, from where its apples and cherries are send across the country and into China. MD Bernard Hall says he bought the company's first Toyota forklift in 2001, one year after the business was founded. "We still have the original forklift and commissioned our latest Toyota just six weeks ago," says Hall, who regularly operates the forklifts himself. "They're smooth, comfortable, reliable and user friendly, as well as being powerful and manoeuvrable and having important safety features," he says. "The biggest thing is smoothness. They're quite precise to operate and there's no jolting or noise when you go over bumps." Bernard and his brother Tim learned the ropes of fruit growing while working at their father's orchard on the outskirts of Orange before Bernard founded his own business in 2000. The company's four orchards in the Orange region, all at an altitude of around 1000m, grow seven varieties of cherries and eight varieties of apples. TMHA Orange branch manager Richard Bopping says Bonny Glen Fruits "is thriving in tough economic conditions through good management and marketing, taking advantage of the large Chinese marketplace for their fresh produce". Bopping says TMHA offers a comprehensive range of three- and four-wheel Toyota battery electric forklifts running off alternating current (AC) and featuring four-way adjustable suspension seats, rack-and-pinion hydrostatic power steering and safety technology such as the Toyota System of Active Stability. Click here to find Toyota electric counterbalanced forklifts for sale. 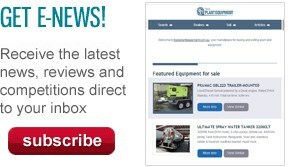 Click here to look up electric counterbalanced forklift specifications.